Health & Safety, do we pay it enough attention in our workshops? I believe that we do, however, most of us call it “Common Sense” along with its well-known travelling companion “Experience”. Over the years I have tried various solutions of Health & Safety. First, it was Safety Glasses combined with breathing in the local air. I was comparatively young and lacked experience about breathing in fine dust. Then I progressed by adding a Face Mask along with the Safety Glasses. I would say that would be my minimum protection and for added safety, I do try and stand out of the line of flight of the piece being turned on the lathe. 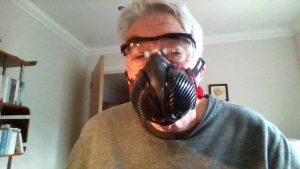 This Christmas I was given the Trend Air Stealth P3 Safety Respirator. Now I find this to be a massive improvement over the Face Mask. 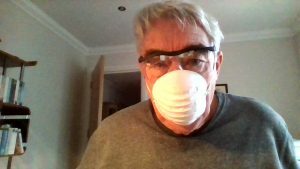 Yes, it cost around £25.00 /$33.00 but it is a big step up from the Face Mask and you can breath easier and the Safety Glasses do not steam up. An excellent addition to my working environment! 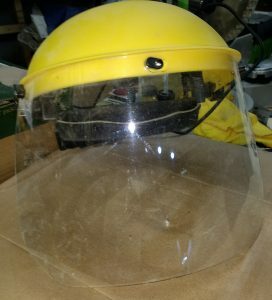 I do also use a Face Shield, very reasonably priced normally well under £15.00/$18.00 but personally the downside to them, well at least the one I have, is that the shield collects static electricity and hence very fine dust. You will find them at Toolpost or any good woodturning oriented tool shop.